Dissolve the yeast in lukewarm water. Add all the dough ingredients in a mixing bowl and knead for about ten minutes. The dough should be soft. Then cover with a plastic wrap or towel and let it rest in a warm place for about 1-1 ½ hours. Take it out, spread the basil pesto, and put the vegetables all over. 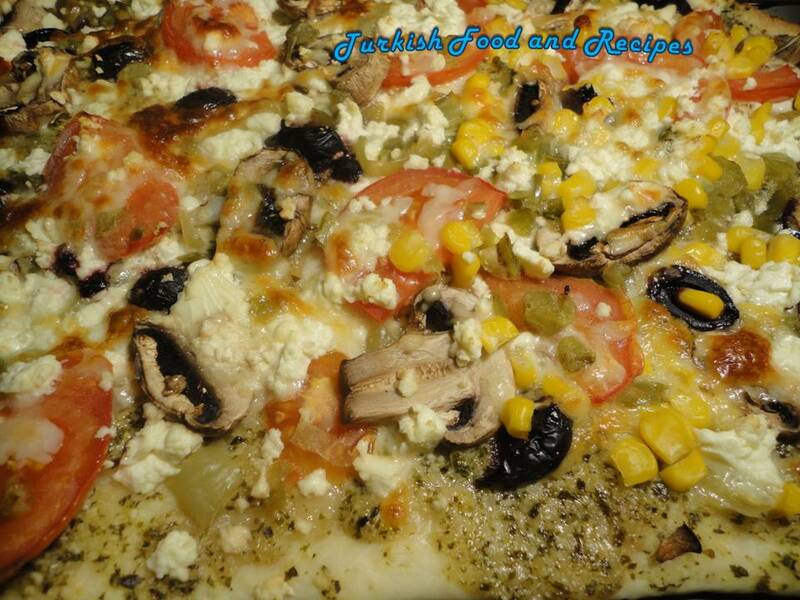 Finally sprinkle with Mozzarella and feta cheese. Bake for an additional 15 minutes or until the top gets brown. Firindan cikarinca uzerine feslegenli pesto sosunu yayin. Sonra da sebzeleri yerlestirip, son olarak kasar ve beyaz peynirlerini serpistirin. Tekrar firina verin. Uzeri hafifce kizarana dek yaklasik 15 dakika daha pisirin. Been meaning to make pizza lately. Yours is full of such goodies. Dont have to make domates soslu for this pizza?Iam so thrilled that I must try this mediterranean hint!